When we first covered our favourite Islamically inspired clothing brands way back in 2015 the industry was teetering between a mix of screen printed Gildan tees and generic Arabic text clothing items. It’s 2018 now, and with clothing brands popping up left, right and centre and brands improving designs and providing greater quality materials we decided we would wade through the plethora of brands once again, to bring you an updated list for the new year. This time around we’ve gone for a varied selection of brands, from higher-end fashion to pop culture-inspired streetwear. We are super excited to share with you the fantastic brands we have discovered and we hope it’s a fair demonstration of the creativity and variety we have in our community. Kicking off the list is Next Ummah, they stock a variety of streetwear items inspired by a mix of Islam and pop culture. Supreme, Drake and Malcolm X all feature in their designs and provide a welcome opportunity for young Muslims to rep their Islamic ideals with a touch of their western upbringing. One of the guiding principles behind Next Ummah is to provide an avenue for young Muslims to rep their religion and feel proud of who they are. Their designs are innovative and refreshing with bold designs and quirky images particularly on their graphic tees. Some of their standout designs include the ‘Sunnah’ tee, ‘Malcom X Men’ tee and my personal favourite a Muslim American rendition of the famed art piece ‘American Gothic’. 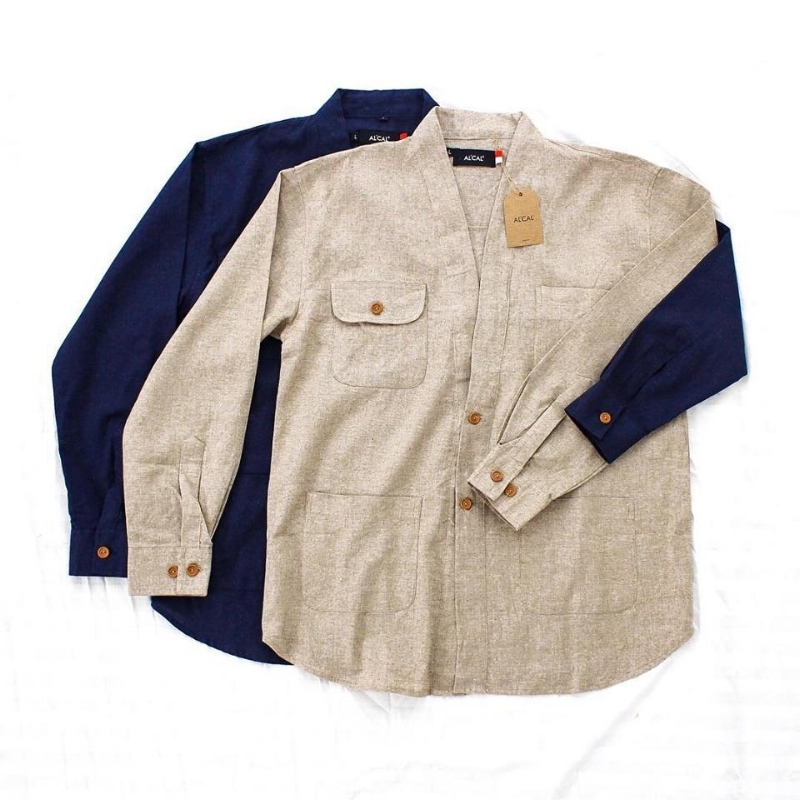 Alongside the above-mentioned items, they also stock hats, sweaters and long sleeve tees. Launched in 2016 Next Ummah have done a wonderful job of putting together a solid collection and although it isn’t the largest collection on the list with their creative eye and originality I would expect them to be expanding with new items in the near future. 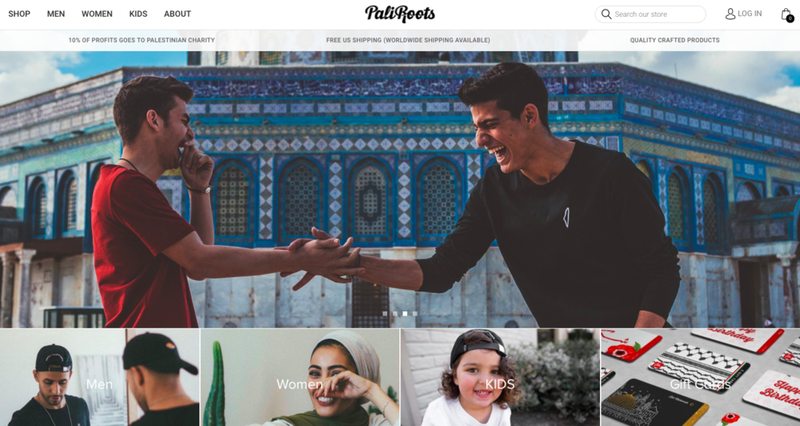 Founded in 2016, PaliRoots is a brand centered on sharing the beauty of Palestinian culture with the world, with particular emphasis on doing so through artistic expression rather than overtly political overtones. In developing the idea for their brand, brother and sister Hussein and Aminah Musa realized that most media attention paid to Palestine deals with war, and they wished to mark a shift with their brand towards expressions which highlighted non-political aspects of Palestinian culture such as its textile, architecture and agricultural production, through their products. Overall, they strive to provide an excellent customer experience coupled with novel, high-quality products which reflect the many beautiful aspects of Palestinian heritage. Amongst many notable qualities which distinguish this brand is its commitment to charitable works which directly affect the lives of the Palestinian people. This past fall, through partnerships with Zam Zam Water and the Middle Eastern Children’s Alliance, the PaliRoots team gathered winter clothing and over 1,500 backpacks and hygiene kits from a Palestinian factory and personally distributed them to over 1,000 kids living in Gaza. It’s always heartwarming to see Muslim companies supporting their brothers and sisters and the extra touch of personal effort makes these actions even more beautiful. With regards to PaliRoots’ products, offerings range anywhere from keffiyehs produced by the Hirbawi factory, the last such factory in Palestine, to refreshingly minimalist jewellery and caps to organic soaps and maps of Palestine. The diversity and originality of their products are indeed their strongest points and they somehow manage to outdo themselves with each new collection. Success for PaliRoots only continues with the release of their newest collection, called “Filistin”. Check it out in this awesome lifestyle video below! Indonesian based brand AL'CAL was quite the unique find, a mix between high street fashion and traditional Islamic menswear. They stock a range of really well tailored smart casual shirts alongside a multi-coloured collection of ‘Miki’ or brimless skull caps which double as a contemporary alternative to the Masjid kufi. AL'CAL have done a great job in creating a clothing range that is current but also seeks to maintain timeless Islamic guidelines on modesty and simplicity. Personally, as a fan of minimalist clothing I love the mix between the sharp tailoring but also casual elements to their collection such as the kimono variation that they stock. If you’re looking for trendy but also purposefully designed clothing we’d definitely recommend checking out AL’CAL. At this current time in order to purchase items from their collection you’ll need to set up an account through the LINE.me app. A potent player in the streetwear industry, TwelvePieces was founded by 24-year-old fashion designer Amir Hassan in 2013. Hassan, a Dane by citizenship and an Egyptian by birth, developed a passion for sculpting and drawing from a young age under inspiration from his father and later combined this with his emerging love for fashion, graduating from the VIA Design School in 2017. With regards to his brand, his message is simple yet potent – in designing clothes which he believes are pure expressions of his heritage and influences, he seeks to inspire others to stand proud for who they are and what they believe in. Amir’s vision has thus far been extremely successful, with his line appearing on catwalks as well as in editorials from magazines such as Buzzfeed, Vogue and Hypebeast, and we’re definitely excited to see what the future has in store for him. With regard to TwelvePiece’s product line, Hassan produces what he calls “capsule collections”: limited-availability collections comprised of 12 styles of 12 pieces, with each piece appropriately labeled 1-12, which are based upon a particular story or theme. His previous collection, “The Spring” centered on capturing the rebelliousness of the Arab Spring whilst his latest collection, “Roots”, concerns itself with representing his hometown of Cairo, Egypt, and encapsulating values of freedom and brotherhood as well as the positive aspects of Egypt’s rich cultural heritage. TwelvePiece’s current collection includes tees, sweaters, hats, socks, bags and more and we love the boldness of their cuts and graphic art, indeed a staple in streetwear design. Though the pieces themselves are modeled by men on the website, these pieces can easily be incorporated into either male or female streetwear wardrobes. 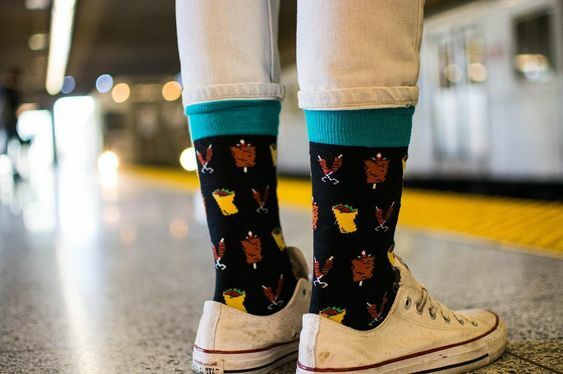 Perhaps our quirkiest featured brand, HalalSocks was founded in 2017 by husband and wife Shehryar and Sara Qureshy, who are based in Toronto, Canada. In searching for socks to give to her husband as an Eid gifts, Sara eventually threw in the towel after hours of scanning the internet and not finding a single pair of socks related to Islamic holidays. Later on, she came up with her own creative designs, which her husband enthusiastically endorsed and mocked up on Photoshop, and the rest is history. Influenced by Canada’s inclusivity, the couple most enjoys their work’s purpose of celebrating Muslim culture through fresh and fun designs and in doing so, contribute to the fight against Islamophobia. Thus far, their message has reached as far as the Canadian Prime Minister Justin Trudeau himself, who upon being gifted a pair by the couple, wore them on two public occasions. Additionally, they donate 5% of every sale to the Islamic Relief Worldwide Charity, further contributing to helping the Muslim community in every way possible. HalalSocks are made from fine, combed cotton and are available in an array of colors and designs, including those featuring mosques, crescent moons, shawarma and more! Recently, they’ve begun producing fun pocket squares as well and we look forward to seeing how this new line from them develops alongside their sock collection in the years to come. And that concludes our list! Thanks for checking out the article, be sure to visit their websites and help support this awesome sector of Muslim commerce. If you have any suggestions of alternative brands that should have made the list comment down below and perhaps they'll be featured in the next article. Special mention to Tyler from @themuslimmale our ever-present fashion expert for working with us on this post be sure to check out his page for all the latest on fashion and clothing. Enjoy this Article? Please feel free to share it on your social media, Also don't forget to give us some feedback. We are on FB , Twitter and Instagram!